Now you will have a place for all of the lighter loose items that you need rapid access to…. 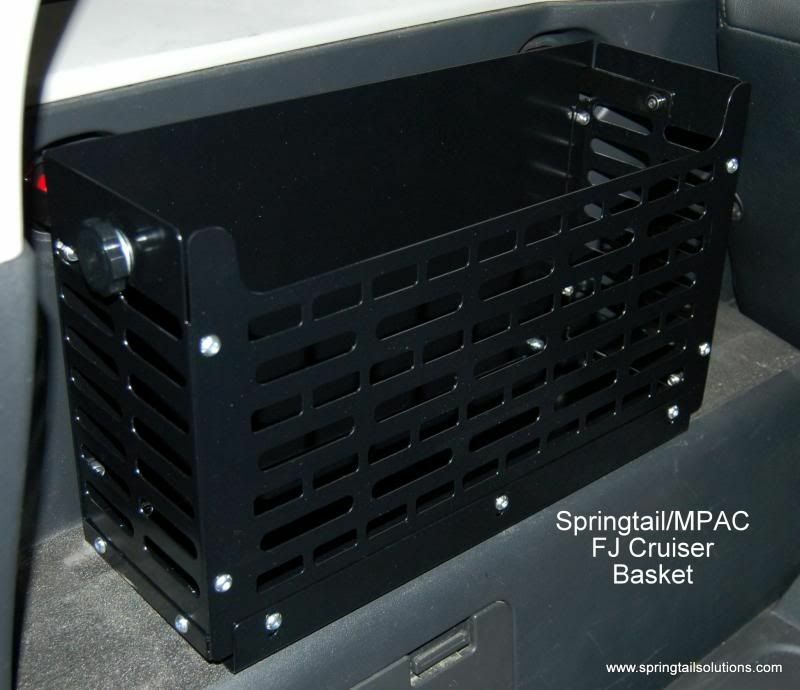 The FJ Cruiser basket provides a place for you to stow the lighter loose items in your cargo area that formerly did not have a place. 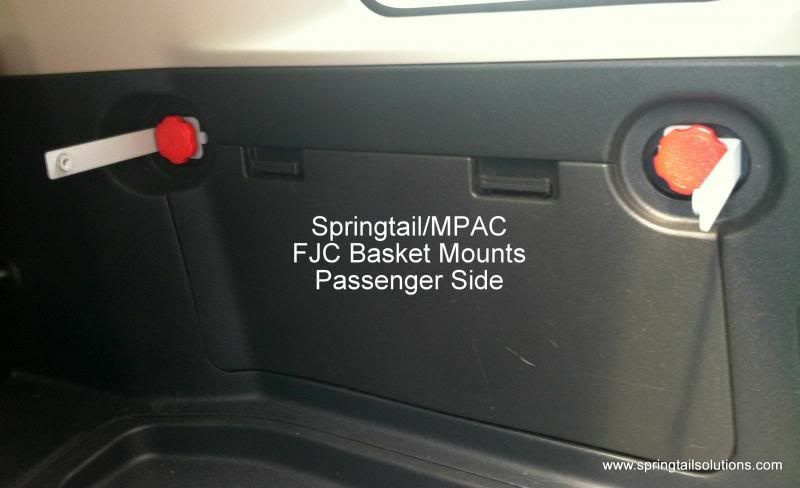 It also provides instant access to these items yet they are still secure enough for off roading because of the deep basket design. Is there some other cool function? If you place it on the passenger side of the FJ Cruiser, it will discretely cover the opening for the “hidden compartment”. No one who is not intimately familiar with the FJ Cruiser will ever figure out that you have a secret “stash”. Can I put it on either side of the cargo area? How hard is it to assemble and install? Not at all, all you need is a 10mm socket/ratchet. We provide the Allen wrench. Plan on 30 minutes to assemble and install the unit. The capabilities of the basket have not been tested to full extremes yet, we figure that it will safely hold about 15 pounds. Perfect for tow straps, 1st aid kits or even jackets and blankets. Please keep in mind that since there is no top on the basket to safely stow heavier items in secured bags or boxes. Can I bolt a power tank to the basket? No, that’s just crazy talk..…go sit in a corner until you come to your senses. Seriously…define rapid access to the “hidden compartment”? 2 Black Knurled knobs provide the ability to install or remove the unit in a matter of a few turns of the knobs. No tools required after the initial installation. The mounts can also be removed with supplied Red knurled knobs. This thing is so incredibly useful- it's a must have for your FJ. Solid construction, the easiest of installation. A great, great, production. 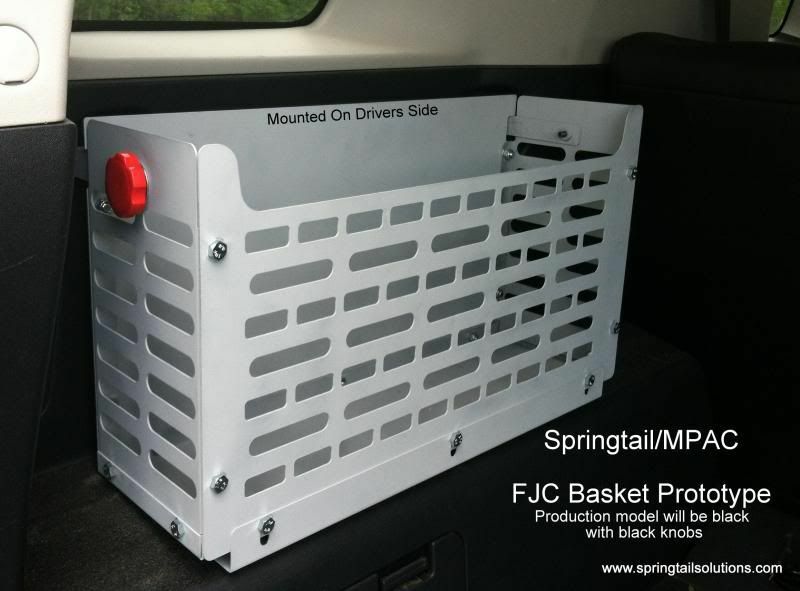 This product got me hooked on Springtail Products. I installed one on the driver side in my FJ. Works great, looks great. Keeps things very secure, despite no lid. I have asked for a second basket for christmas for the passenger side. Everything looks great, and as advertised, but I didnt have any of the 10mm nuts needed for assembly! It's a quick, inexpensive trip to hope depot, but still pretty annoying. Everything else seems great though, pieces well fabricated and sturdy. 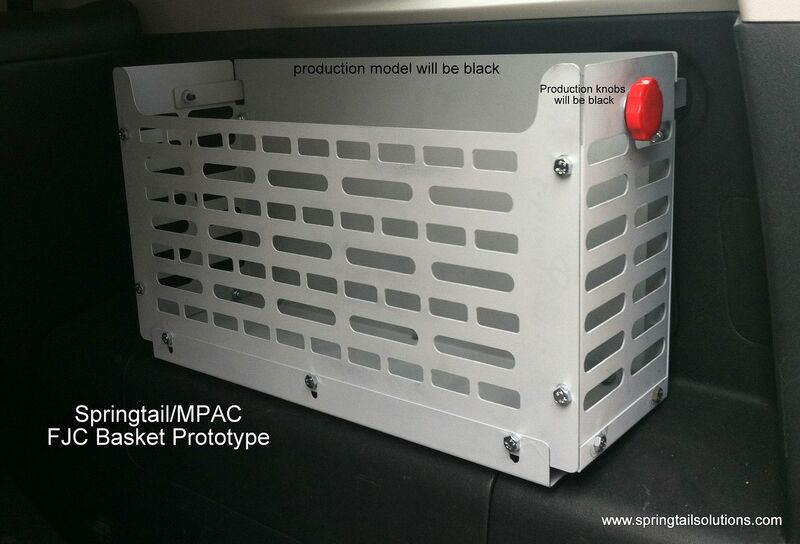 Looking forward to getting it installed - after a run to the hardware store.